In Mexico, as in Italy, China, Japan, and France, every region have similar foods and dishes that are transformed and prioritized by local customs--every state has mole, but some states emphasize it, like Michoacan, Guerrero, Oaxaca, Puebla, and Estado de Mexico. Every state prepares seafood, but Nayarit, Sinaloa, Sonora, and Baja California take it to the next level with preparations that highlight the superior product. And every state grills but none like the northern state of Sonora where quality steers and a dedication to fire make carne asada a sacred tradition--Oaxaca has mole, Hidalgo has barbacoa, Jalisco has birira and Sonora has the parrillada, or grill. Four chefs have journeyed north of the border to bring a true taste of the Sonoran grill. This Saturday at the Hola Mexico Film Festival's Gran Parrillada at La Plaza de Cultura y Artes, from 12pm-5pm, chefs Carlos Valdez (Buffalo BBQ, La Paz, B.C.S. ), Eloy Uribe (sb2, Hermosillo, Sonora), Javier Plascencia (Mision 19, Tijuana, B.C. and Bermejo, Hermosillo, Sonora), and Dante Neuquen (Neuquen Restaurante, Monterrey, Nuevo Leon). 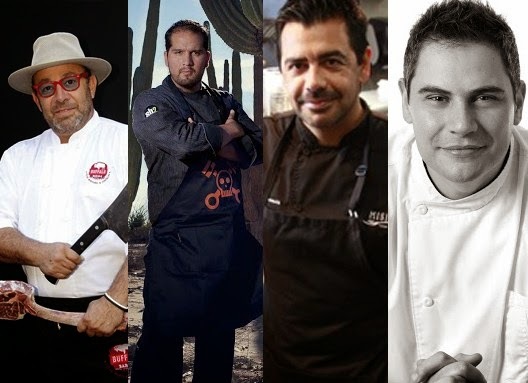 Valdez and Uribe are from Sonora, Plascencia has recently opened a modern Sonoran restaurant in Hermosillo, and Neuquen cooks in another great northern state, Nuevo Leon, and comes from one of the top grilled meat countries, Argentina. This is an Olympian grill team. Each chef will prepare their own parrillada, or grill plates to be served with a sobaquera tortilla and Mexican wine from Baja California. This is a once in a lifetime chance to experience top Mexican chefs on the Sonoran grill, and even more amazing is the addition of a traditional sobaquera artisan, making the famous giant, and thin flour tortillas from Sonora that are essential to the cuisine. If you hurry, you can get a discounted ticket on guilt city from now until May 14th at noon, and after that just go to the ticket link.